Every Exchange Online plan (except Kiosk plans) have the ability to have an in-place email archive. By default, on all plans, the in-place email archive is disabled for all users. An administrator must enable it before it can be accessed. The in-place email archive contents are stored ONLY in the cloud. They are never synced to a desktop as the Inbox is. The in-place archive folders are only visible with the Outlook version in the Professional Plus product. Other versions of Outlook will not display the archive folders even though they may be present and enabled. Plans that include Exchange Online Plan 2 (E3, E4) have an unlimited archive. 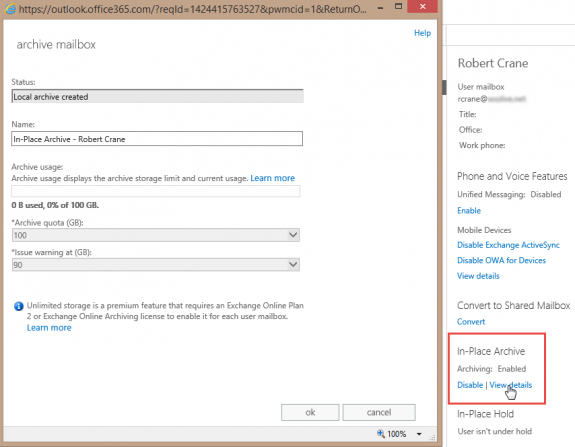 Plans that have Exchange Online Plan 1 (Business, and E1) have a current limit of 50GB of storage between the Inbox and the Archive. For example, in Exchange Online Plan 1 you could have a 25GB Inbox and a 25GB Archive, or a 10GB Inbox and 40GB archive. With Exchange Plan 1 the total size of the Inbox combined with the in-place archive cannot exceed 50GB. You can enable the in-place archive using the Exchange admin portal or using PowerShell. You can see that the mailbox currently has an Inbox and other default folders but no archive mailbox. 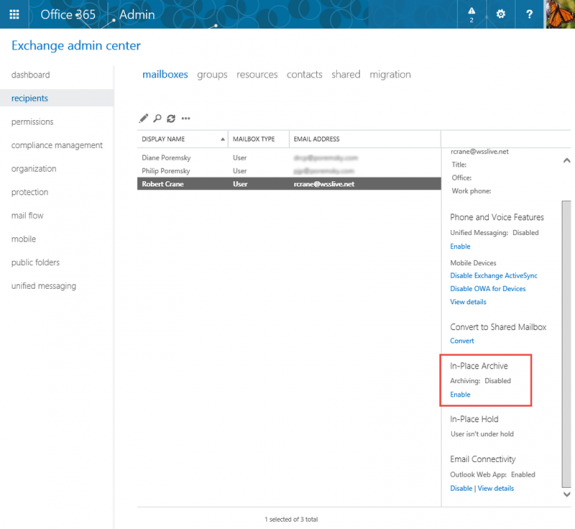 The first step is to login to the Office 365 admin portal as an administrator and select Exchange in the lower left corner of the window to log into the Exchange admin center at //outlook.office365.com/ecp/. Select recipients then mailboxes and then select the mailbox you wish to enable the in-place email archive. From the information in the right hand side panel select Enable under the In-Place Archive heading. Select yes to enable the in-place archive. After a few minutes (the process is not instantaneous) a new folder will appear in your Outlook web called In-Place Archive – <name> or in Outlook desktop called Online Archive -<name>. The archive is now ready to use. Users can drag and drop items into the archive folders and email policies (user and organizational) can now utilize that folder. As an administrator, if you again look at the mailbox, under in-place archive you will see an option View Details. Selecting that will show you a window providing details of the mailbox. Remember, this options vary depending on the Exchange Online plan the mailbox is subscribed for. Robert has a degree in Electrical Engineering as well as Masters of Business Administration. He is a Certified Office 365 Administrator and SharePoint Professional. Robert has over 20 years of IT experience, including working on Wall St in New York. He has been recognised by Microsoft as an Office 365 Most Valued Professional since 2012. He is the Principal at the Computer Information Agency. Apart from working with client technical and business issues, Robert continues to present at seminars locally and internationally He can be contacted directly via director@ciaops.com. Hi, Online archive is not working in outlook 2016, i can see the online archive in outlook on left pane and set policy on some folders to move items older than 1 week to online archive but nothing happened, Any help will be highly appreciated. Is the mailbox manager process enabled and running on a schedule? To access their archive mailbox using Outlook, users need one of the following licenses. 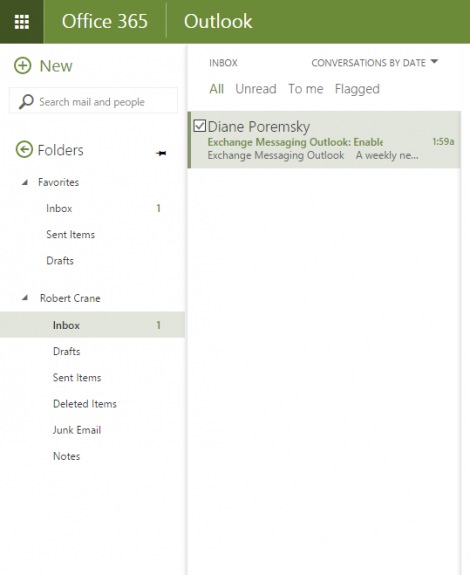 Hi Diane, I was wondering if there is a specific version of Outlook needed (like Pro Plus) to see the online archive. We have read some articles indicating it has to be a particular type of Outlook installation, meaning those with Office 365 Home or a retail version of Office with Outlook wouldn't be able to see it. Thanks for any expertise you can lend to this. We consider Slipstick to be an authority in all things Outlook. It will not be in Home or the retail version. Is there any way to access archived mails from the native IOS mail app on iPhones/iPads, or do you need to use OWA to retrieve mails in the Online Archive ? I enabled Online Archiving yesterday. The oldest mail in my archived inbox dates 2 years old. I tried to search for the Sender and the subject from my native mail app, but can not find those mails. Not sure whether I'm to impatient (I waited one day), or whether OWA is required to do this. Is there anyway to hide the online archive of a delegated account? I have 6 delegated accounts as well as my own but i also can see all their archives, it's just making my mailbox list too busy, any ideas? How did you open the accounts in your profile? i didn't think they showed up if opened as a shared account, but will double check. E2 archives are supposed to be unlimited now. In they past they were limited to 50GB and they set a default of 100GB when they raised it to unlimited - all mailboxes should have been raised automatically to 100GB within a few months of the increase. I'll see if i can find out anything about this. Transferring mail to a shared mailbox is a PITA (but will solve the problem for now)... but it will eventually be full too. While you can keep making more shared boxes, searching is a pita. >> They increased his primary mailbox to a non-standard quota of 100GB, but the server is still set to warn him when he approaches (and passes) the 50GB mark! it sounds like they didn't raise the warning level when they raised the quota - see https://technet.microsoft.com/en-us/library/aa998353(v=exchg.160).aspx for the cmdlet to change it. But... i'm surprised they raised the mailbox to 100GB - i thought that was limited to 50 GB. We have Office365 Business Premium (and Office2013) which only gives me 50GB of storage per mailbox. So I like your concept of leaving the older items in the mailbox and not sync'd. I also like your idea of using the online archive. But I am worried that since we only get a total of 50GB per mailbox, that if the mailbox fills up becos the online archive folder is getting full, I cant get the online data off and so I either have to upgrade my plan to get infinite storage or delete some of the data out of the archive! Tks for the tip about not be able to archive to a pst! Yeah, you are more limited with the business-level plans - one option is to not enable the online archive - then Outlook's AutoArchive should work. Does anybody can tell me what kind of archive is on Exchange Online? Is it a .pst or something else? Thanks a lot, i am looking for the info since 4 days and i am despairing me. The online archive is a mailbox, not a pst file.